Laser hair removal is a common procedure performed by dermatologists. The technology utilises a light source of a specific wavelength that targets pigments within hair follicles. When the laser energy is absorbed by those pigments, heat is generated, which can destroy the hair follicle selectively without causing too much damage to the surrounding tissue. 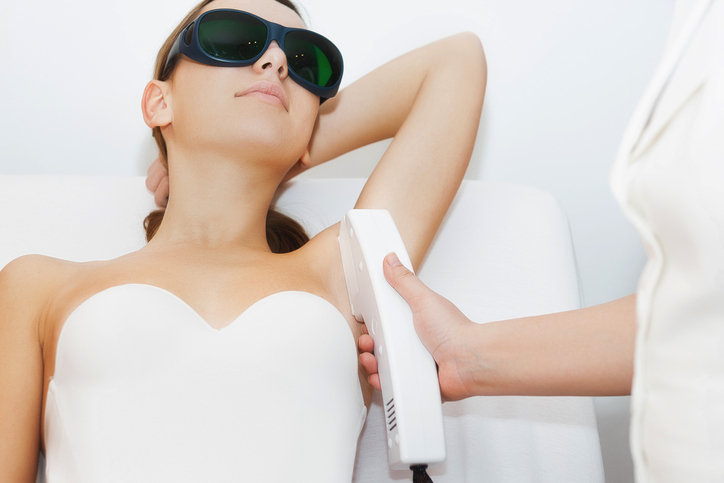 To reduce the risk of damaging the adjacent tissue and the surface of the skin (epidermis), current hair removal lasers incorporate an inbuilt cooling system that “precools” the epidermis before the laser beam is fired. This allows the use of higher fluences (energy levels) to reach the hair follicle, while simultaneously reducing pain and the risk of burns. What type of lasers are used during the procedure? At Thomson Specialist Skin Centre, we utilise the Gentlemax laser system, which incorporates the long pulsed Nd-Yag (1064nm) as well as the Alexandrite (755nm), ensuring coverage for all skin types. The use of an epidermal cooling system and suitable wavelengths reduce the risk of complications or burns from laser hair removal that are generally higher for darker skinned patients. If I go for laser hair removal, will I ever have to shave again? While laser hair removal can achieve long-term inhibition of hair growth after multiple sessions, it does not mean that the hair will never grow back. It does, however, reduce the need for constant shaving and waxing for a longer period. Take note that there may not be very noticeable improvement after a single session – there is a gradual reduction of hair density and thickness with each successive session, until hair growth is inhibited. In addition, laser hair removal does not work equally on all patients. Typically, patients with fair skin and dark hairs respond better to treatment. It also does not remove white hairs. What do I need to do prior to laser hair removal? Patients should not wax or pluck their hairs two weeks before undergoing laser hair removal. They should also avoid excessive sun exposure and tanning, as tanned skin may absorb the laser light, increasing the risk of burns. How many sessions would I need? After the procedure, it is important to use sun protection in order to reduce the risk of post-laser hyperpigmentation. The treated areas may not be completely devoid of hair after each session, but any remaining strands of hair tend to be lighter in colour as well as finer in texture.